Thanks to Steelrattus for looking after the shop while I had a holiday. It’s always fun to see read other people’s insights into the music in my collection and, as long term readers will testify, there has been rather a lot up to this point and there is far much more to follow. The Music Project is a labour of love, one which I do for fun and it’s a great opportunity and fun challenge for writers to dip into. Which is why new writers are always welcome here. Mostly though I do it myself. Doing it yourself was pretty much the buzz of the nineties. On the back of the likes of Ground Force and DIY SOS, the popularity of nipping down to B&Q at the weekend for a bag of nails and some 2-b-4 grew. 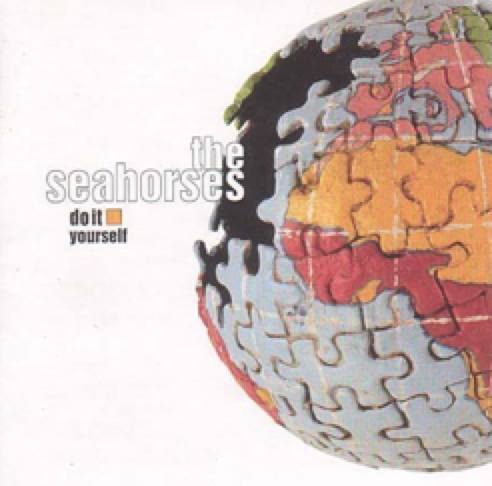 Sadly so did the popularity of the Seahorses through the use of the term Do It Yourself in this, their first album. Continuity has never been my strong point. Anyway, I’d never heard of the Seahorses. So imagine my surprise when a the happy age of midtwentysomething a senior work colleague who I happen to have said good morning to while passing in the corridor everyday for several years returned the greeting to me one morning with a copy of this CD thrust into the palm of my hands. “You SHOULD like this” he said, “It’s right up your street”. How the jiggery Thomas he could conclude this from a mere, “Hi!” or cheery “Morning!” as we passed in the dusty corridors of St Annes house in Bootle, I have no idea. None the less, it sat for years more on my book shelf through 3 house moves before being ripped and placed into the box marked “Music Magpie“. Shortly before the fourth house move, my then wife discovered it and exclaimed how much joy the band brought her and then proceeded to play it most days on her car stereo, come home from work whistling or singing the songs and generally liking the album altogether. Personally, I couldn’t stand it. Sure it has all the elements of “indie” nineties and screams Oasis and Shine but there’s nothing unique about the sound. Still, it’s still in my collection. I still have no idea why and the only time I’ve listened to it in its entirety was for the purpose of this music project. It now resides in a folder labeled “Recycling Bin”.